Hi All, it’s been sometime since I did a blog post. The summer vacation is keeping me busy with my kid. Even though I am cooking a lot during holidays, I don't have time to blog on those. I do post the food I prepare on my Facebook page. I felt the urge to do this post for "Daring Bakers". 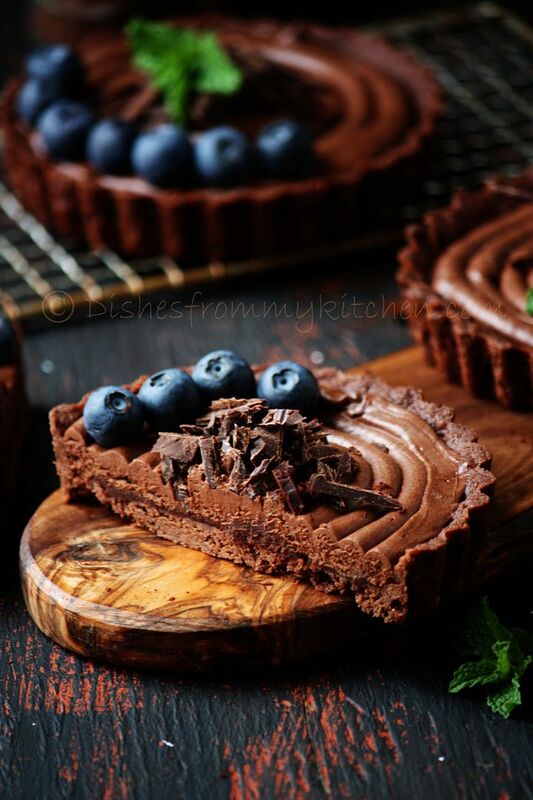 There has been a lot of recipe requests after looking at the pictures in my Facebook page. I will post those recipes in my blog soon. Rachael from pizzarossa was our lovely June 2013 Daring Bakers’ host and she had us whipping up delicious pies in our kitchens! Cream pies, fruit pies, chocolate pies, even crack pies! There’s nothing like pie! If you are looking for plain buttery shells here is one which I have posted before. 1. Combine the butter, sugar and salt in a food processor. Process until blended. 2. Add the cocoa and process until smooth. 3. Add the flour and pulse until the mixture is crumbly but can be pinched to hold together. 4. Divide the dough into six equal pieces, flatter each piece into a disk. Wrap them in a plastic wrap. 5. Refrigerate for at least 1 hour or overnight. 6. Remove one piece of dough at a time from the refrigerator and roll it into a 6 inch circle between two sheets of plastic wrap. 7. If the dough gets too soft, refrigerate until firm before continuing. 8. 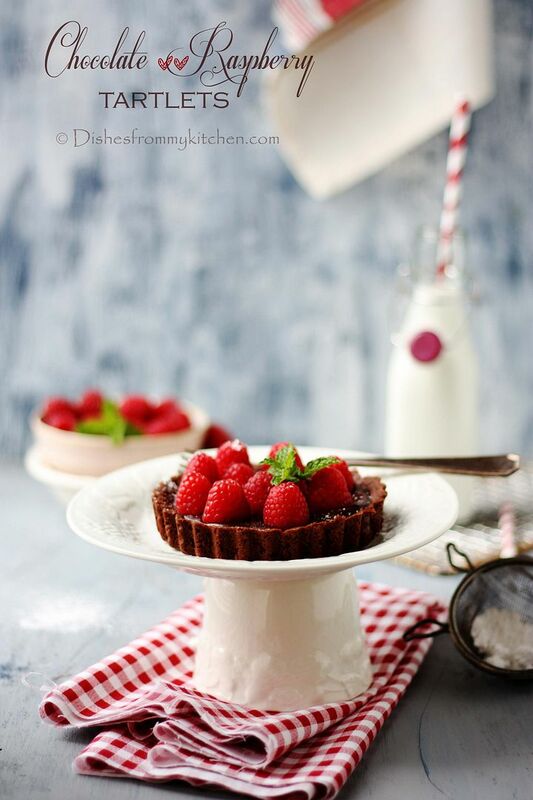 Remove the top sheet of the plastic wrap; invert the dough circle over a 4 1/2 inch nonstick tartlet pan with a removable bottom. 9. Keeping the plastic Wrap on top, press the dough onto the bottom and sides of the pan. 10. Repeat with the remaining dough to make six tartlet shells. 11. Refrigerate for at least 30 minutes. 12. Preheat the oven to 375 F.
13. 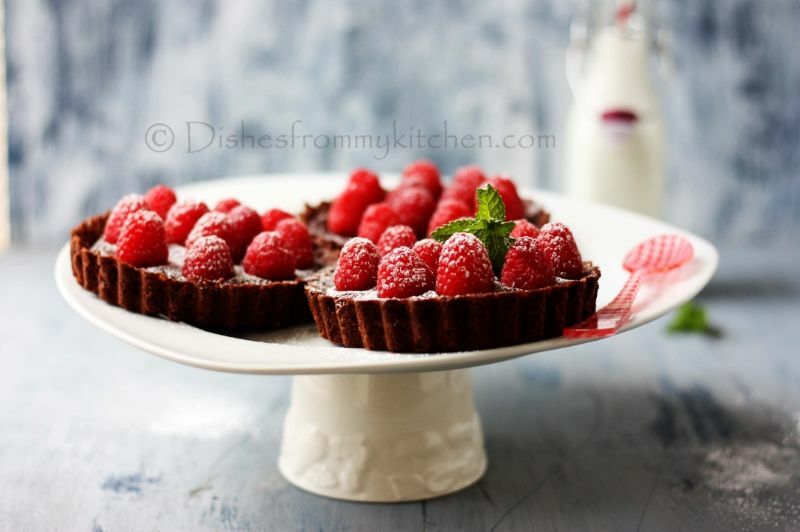 Prick the bottoms of the tartlet shells all over with a fork. 14. Bake for 12 to 15 minutes or until the dough looks dry. 15. Allow to cool completely. 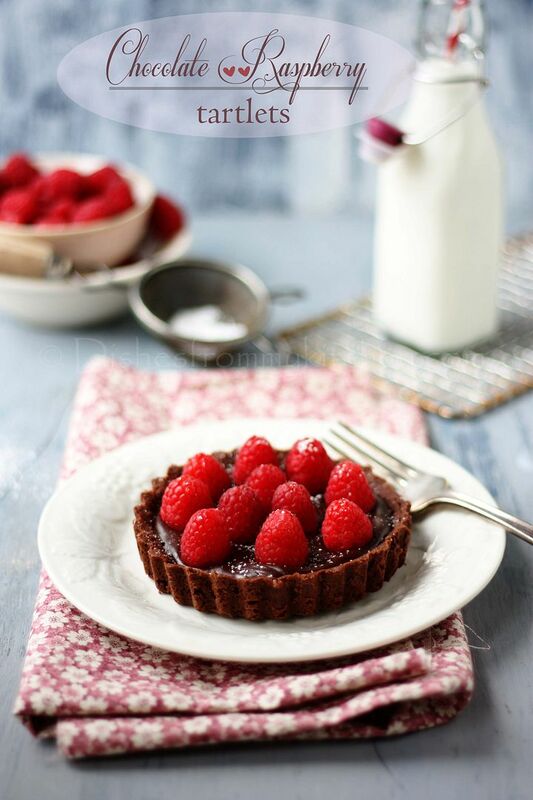 The tart shell recipe and chocolate filling topped with raspberries is minimally adapted from Ghirardelli. This measurement is for 3 tartlets. 1. Bring cream to a simmer in a medium saucepan over medium heat. Remove from heat. 2. Coarsely chop chocolate in a bowl. Add simmered cream (hot) to the chopped chocolate. 3. Let it stand until softened. 5. Place in a larger bowl of cold water or ice cubes and let it stand, stirring occasionally, until cool. 6. Whisk just until mixture forms soft peaks. Evenly distribute among cooled crusts just by spoon or using piping bag as I have done swirls. 7. 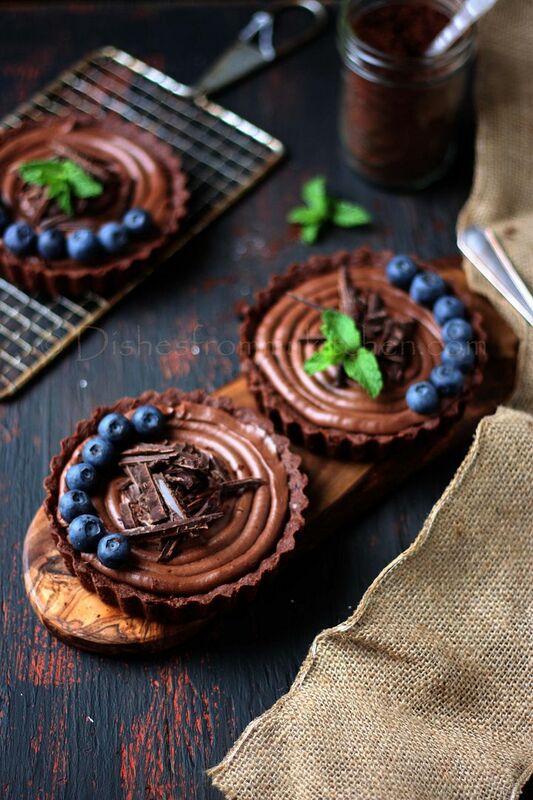 Garnish with chocolate chunks or fruits of your choice. Refrigerate till you serve. Bring to room temperature 15 minutes before you serve. 1. Simmer the cream in a medium sauce pan. 2. 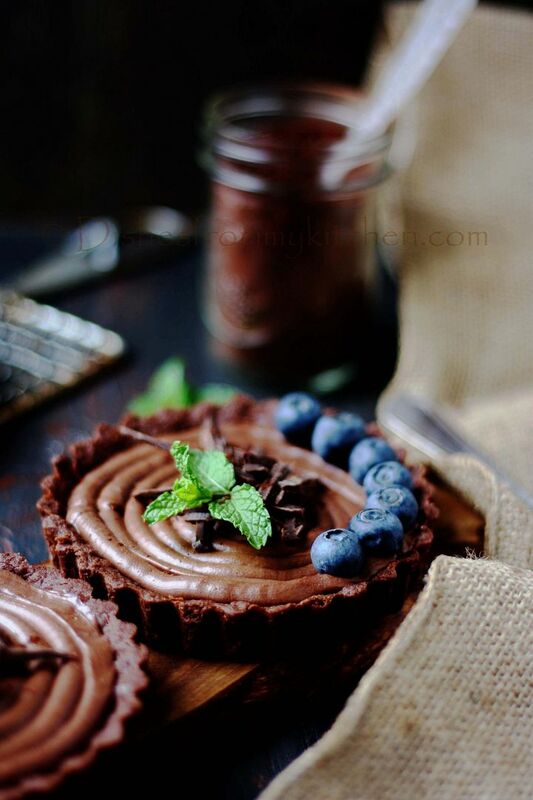 Remove from the heat and add the chocolate. 3. Let it sit for a few minutes to allow the chocolate to melt, and then whisk gently until smooth. 5. 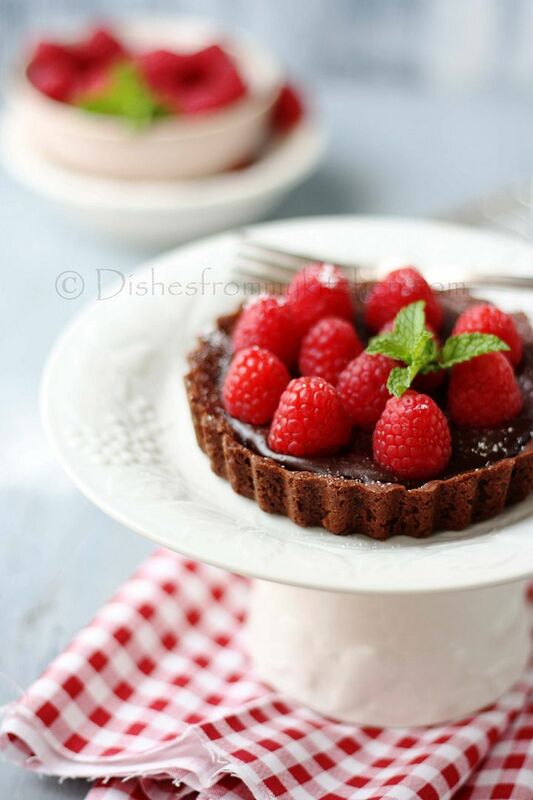 Pour 1/3 cup of the chocolate mixture into each tartlet shell. 6. 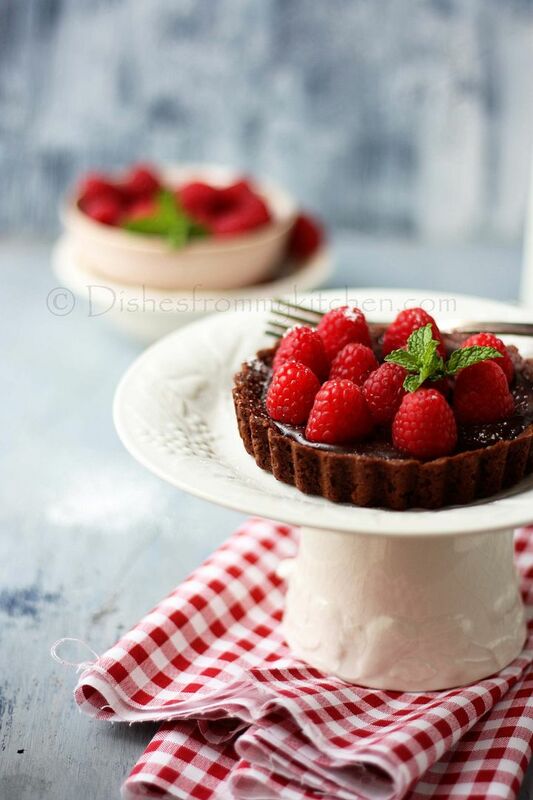 Refrigerate the tartlets at least 1 hour until the filling is firm. 7. 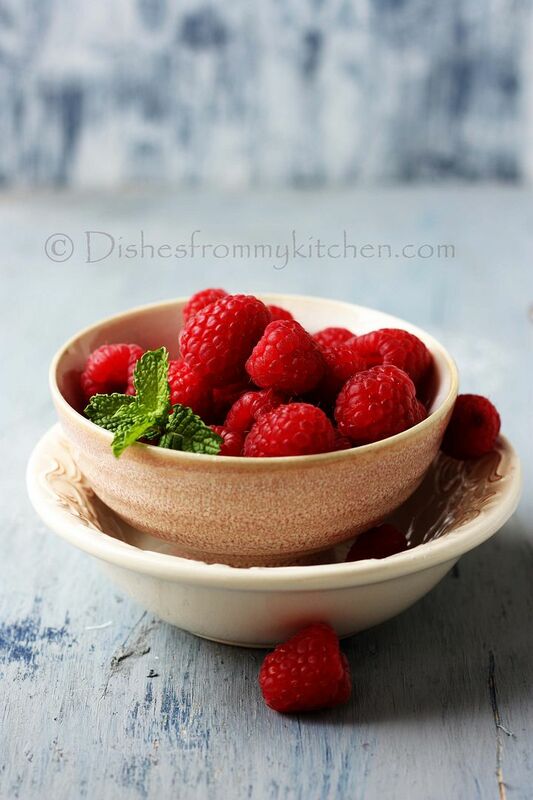 Arrange the raspberries and dust with powdered sugar when you are ready to serve. OMG..is that a piece of art or wat??? 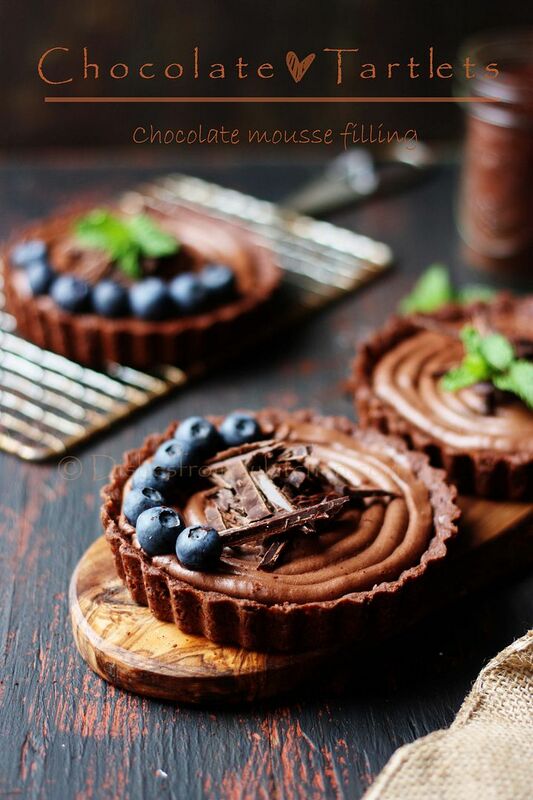 love the tones...simply superb pics...I wish I really could taste this..
wow..looks so yummmm...I am definitely going to make it. Will let you know once I try it out. Loved the styling and presentation. Very refreshing..
First time here..beautiful shots! 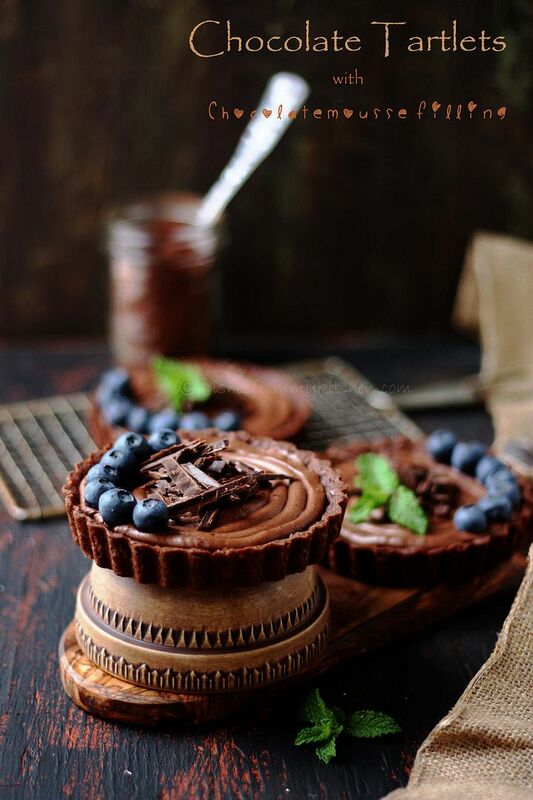 Loved the way you arranged the blueberries on the tarts.. I saw your pictures on the DB forums. 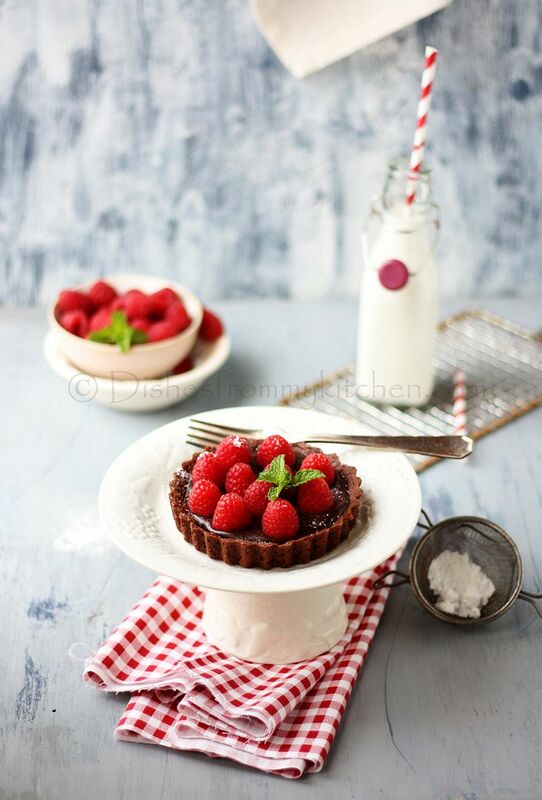 Simple gorgeous, the pictures and your tart assembly! 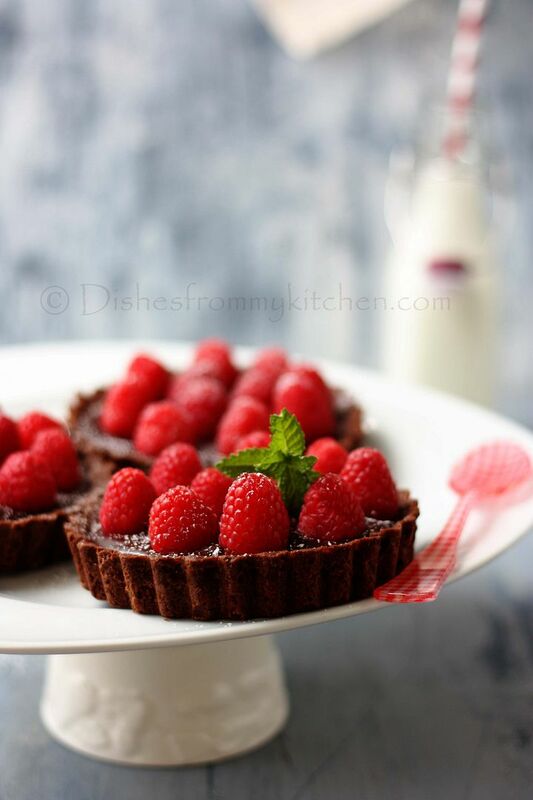 The tarts looks absolutely gorgeous pavithra. Loved each and every photograph as well. The pics are pretty drool worthy. 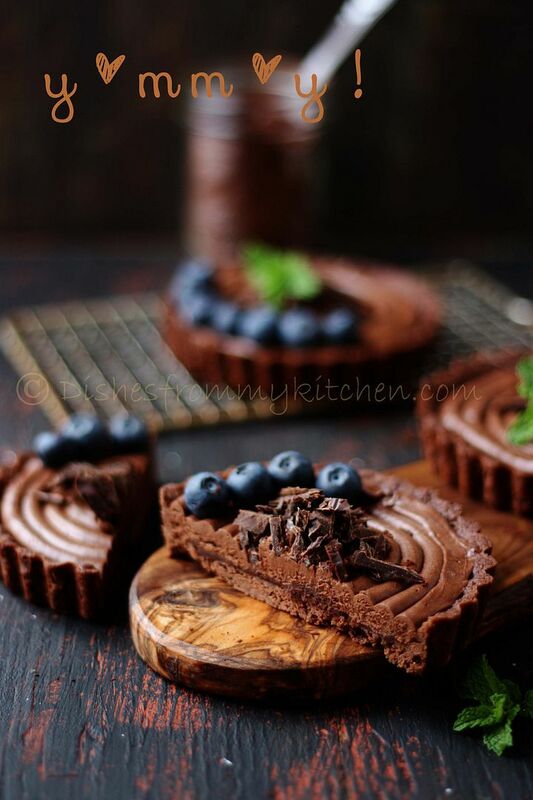 These eggless choco tartlets look so amazing I coud simply take one out and pop them in my mouth. These are so beautiful! Amazing pictures! I wish I can have one now. I hate your website! 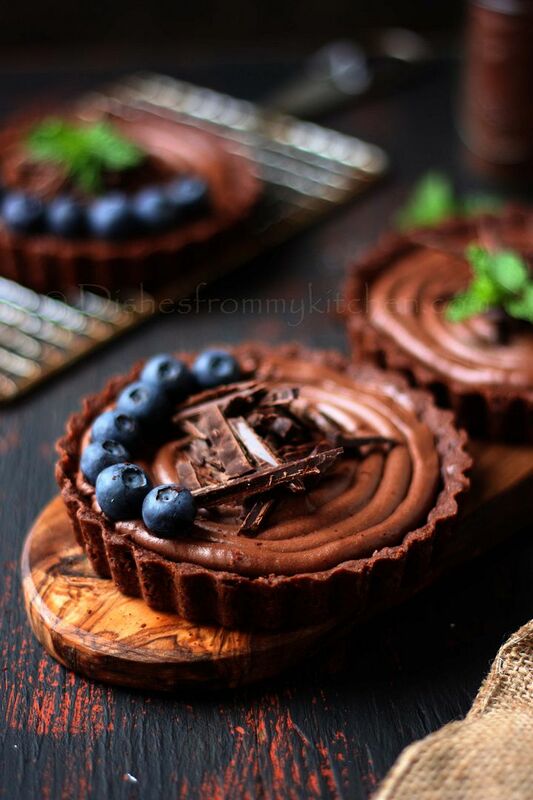 I could almost cry while viewing all those yummy and irresistible tartlets. I can’t help but imagine how it would taste into my mouth. I bet it tastes heavenly! Hope I could have a bite of that right here, right now, please? Sniff. Sniff. Anyway, thanks for sharing the recipe! It would be nice if u share your family pic too..
How long can I keep these assembled in the fridge before getting soggy?